Nowadays, there are so many more ways to watch movies, TV shows and other video programs that don’t involve putting a physical disc in a tray. 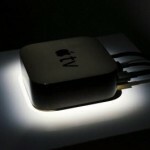 For example, you can’t connect your smartphone to a DVD player, and you can’t stick a plastic disc into your tablet. 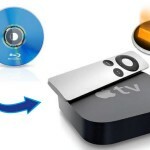 Furthermore, computer manufacturers like Apple are starting to eliminate optical drives altogether. So, you can rebuy all the media you paid for on DVD, or you can convert DVD into a digital format and bring it with you into the future. This task is accomplished by DVD ripper software. 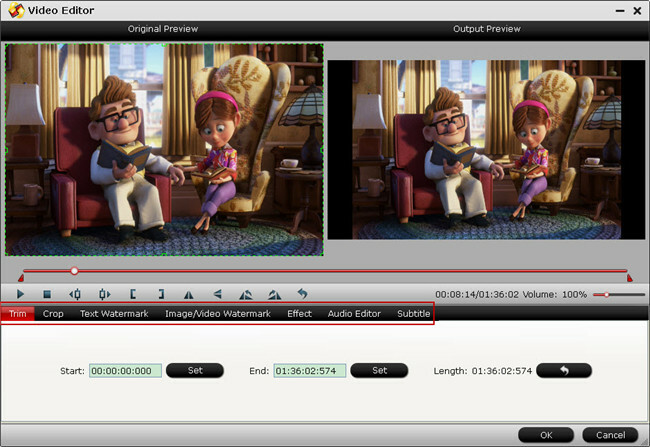 Although there are many free DVD Ripper software that can assist you to make digital copy from DVD movies, however, you may be disappointed to find that some of them like Handbrake lacks the ability to handle commercial DVD disc with complicated copy protection, others like VidCoder may only handle very limited DVD protection. 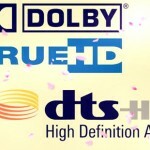 Fortunately, here comes Pavtube Free DVDAid, which is equipped with powerful disc decryption ability to automatically bypass up to 14 types of copy protection including region code, RCE, key2Audio, UOP, CSS, Macrovision, Disney X-project DRM (99 titles DVD encryption included), FluxDVD, Protect, ARccOS, AACS, BD+, ROM Mark, BD-Live, etc. With the program, you can make digital copy from DVD disc, but also from the raw files including Video_TS folder and DVD IFO/ISO image file. Besides that, you can also extract audio from DVD and save as MP3, WAV, WMA, MKA, AAC, AC3, M4A, MKA, FLAC, AIFF, etc. 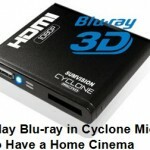 You can then conveniently play the created digital copy from DVD on your computer, transfer to smartphone, tablet or stream to your large TV via game consoles like Playstation, Xbox, TV boxes, media streaming devices, etc. For your convenience, Pavtube Free DVDAid is available on both Windows and Mac platform (get Mac version). In addition, it is totally free and doesn’t feature any ads or bundled adware, therefore, just feel feel to download and install it on your computer. The program itself is quite simple to use. Anyone can learn to use it in minutes. The result file with this free tool is pretty high quality, you can’t find any difference between the ripped file and the original DVD disc. Clicking the Format bar, from its drop-down list, you can output DVD to one of your desired digital format. Here, we choose convert DVD to MKV HD by following “HD Video” > “MKV HD Video(*.mkv)”, you can also choose other digital format according to your own needs. Step 3: Edit DVD movie. 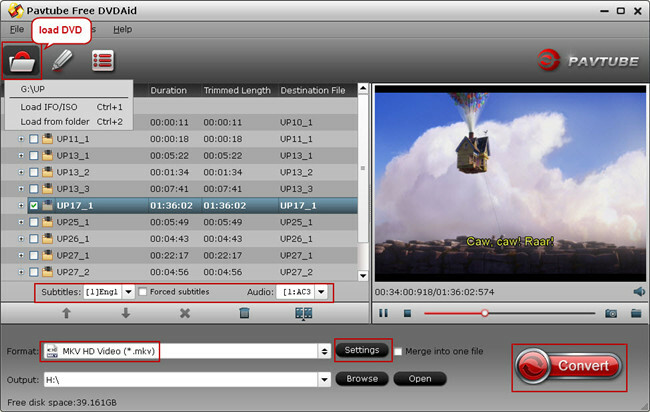 You can also do some simple video editing task on the DVD movies to trim unwanted parts, crop off blacks bars, apply special rendering effect, add watermark, insert external subtitles to DVD movies in the video editor window. Step 4: Start DVD to digital copy conversion process. 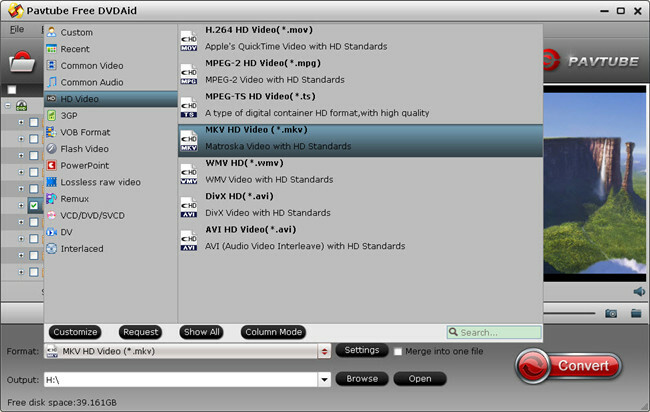 After all setting is completed, hit the “Convert” button at the right bottom of the main interface to begin the free digital copy process from DVD. When the conversion is finished, click “Open Output Folder” icon on the main interface to open the folder with generated files. You can then feel free to enjoy the digital copy anywhere at any time as you like. Tips: As a DVD digital copy converter, Pavtube Free DVDAid has many obvious limitations. You will get no chance to output some common digital format such as MP4, H.264, H.265 and also hot devices and programs preset profile formats from it, in addition, you can’t get lossless DVD copy such as 1:1 full disc copy or main movie copy with this free tool. If you wish to get more output format options, please switch to download Pavtube BDMagic for Windows/Mac.